Richter appears from a flash of light while swinging his whip. Richter Belmont is a vampire hunter from the Castlevania series of games, and the descendant of Simon Belmont, who debuted as the main protagonist of Castlevania: Rondo of Blood. Richter faces the resurrected Dracula in the year 1792, storming Castlevania after the town of Aljiba was burned by Dracula's forces and innocent maidens were kidnapped, including Richter's girlfriend. He is a playable fighter in Super Smash Bros. Ultimate. Richter makes his Super Smash Bros. debut in Super Smash Bros. Ultimate as a third-party character. He appears alongside fellow Konami characters Solid Snake and Simon Belmont, Sega's Sonic the Hedgehog and Bayonetta, Capcom's Mega Man, Ryu, and Ken Masters, Bandai Namco's Pac-Man, and Square Enix's Cloud Strife. He and Simon were confirmed to be in the game via a Nintendo Direct that took place on August 8th, 2018. Richter is voiced in English by David Vincent, reprising his role from previous Castlevania titles, including Portrait of Ruin, Harmony of Despair, and The Dracula X Chronicles. 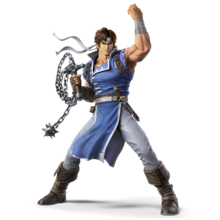 Richter is classified as an Echo Fighter of Simon, with his moveset and animations being based directly on Simon's (although the two actually take inspiration from each other). Richter's special attacks are Axe, an ax that is a powerful projectile; Holy Water, a multi-hitting projectile, with a blue flame that does aura damage instead of an orange burning one that does flame damage; Cross, a projectile with boomerang-esque properties; and Uppercut, a powerful uppercut that functions as his recovery move. Richter's Final Smash, Grand Cross, is functionally identical to Simon's identically-named Final Smash. In Simon's debut trailer, he saves his ancestor Simon from Dracula's attack, and shouts a variant of his famous line from Castlevania: Symphony of the Night (quoted above), "Die monster. You don't belong in this world!" Richter's Classic Mode route has him fighting other Echo Fighters. "You don't belong in this world!" This page was last edited on February 24, 2019, at 17:27.